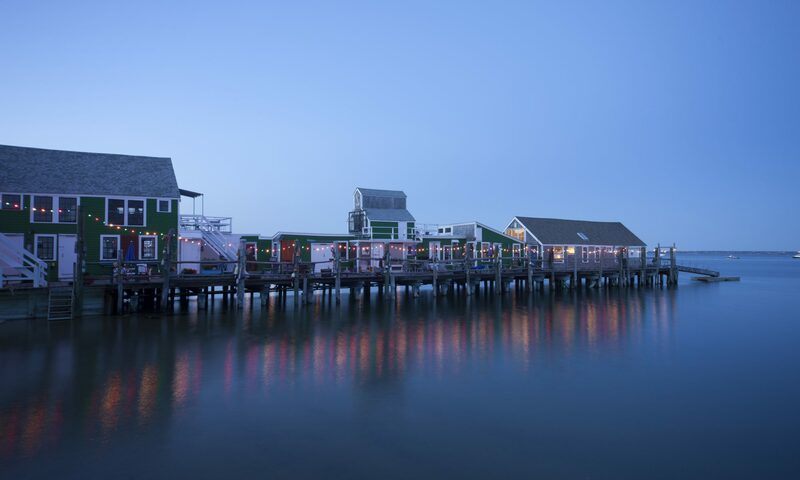 Airy studio way out on the wharf with a loft, deck space east and west to capture magnificent Provincetown views. There are two twin size beds downstairs and a full size bed in the loft. 2-story Townhouse Cabin (over 1,000 sq. ft). Downstairs has a modern kitchen, a half bath, dining and living area with big windows looking out across harbor. Staircase leads up to 2 bedrooms with full and queen size beds, skylights, an extra twin bed, and full bathroom. Spacious airy, contemporary apartment with ample closet space. Very private, secluded. Walk out through French doors from living room onto deck to views of Provincetown Harbor and Long Point lighthouse. A little bit of heaven. Water views from every room: sunny eat-in kitchen and charming living room. Two romantic lofts, plus a day-bed that converts to a single bed in the living room. Private deck with awning and spectacular water views: East to the town; South to Long Point Light and West to the beach and sunsets. Comfortably furnished, the Bridge has a lovely sense of privileged privacy. Parking is shared with 2 other units in tandem. Bright, private, garret-loft cabin with south facing deck. Cabin has both water and West End garden views. Studio cabin with a hand-hewn beam ceiling, window views on both sides of the wharf. Wake up with the beach just steps from your door. Large and comfortable unit with the beach just outside your door. Living room with queen-sized futon and a cozy sleeping cabin with double bed. Perfect for quiet relaxation or entertaining. Ideal for 2 people but can accommodate 4 people. Cozy and romantic upper corner studio with great views of the water from every window. Vintage touches everywhere! Deck space overlooks harbor. Nostalgic views of Old Provincetown from far out on wharf. Loft with double bed, studio couch downstairs. Windows and water on both sides. Vacationing in Ribbons at Captain Jack’s Wharf is stepping back in time with present day amenities. Tennessee Williams found “his true love, Kip “ while staying on the Wharf and Tennessee is said to have worked on Street Car and Glass Menagerie in various places including Ribbons. With a king and full sized bedrooms, large living/dining area, two baths, fully equipped kitchen, new appliances, Ribbons offers the most unique combination of past and present. The owners have updated Ribbons with new windows and four new skylights that open and close with the touch of a finger. You will enjoy everything Ribbons has to offer beginning with the Commercial Street parade , the bedrooms’ views of roof tops and gardens, the moon and stars over your king bed. Take your morning coffee and walk 10 steps from your door onto the wharf for spectacular sunrises over Long Point or take your cocktail to enjoy the ever-changing breathtaking skies at sunset. Sit on the wharf meeting new and old friends, or simply read the latest novel, or lean against a piling and watch the fish and horseshoe crabs pass below you. In addition to Ribbons itself you’ll have the charming West End for walking and you’ll have all the Wharf amenities: WiFi, bonus private outdoor shower, beautiful flowers, comfortable outdoor furniture, association stairs to the beach, a dingy dock to drop off or pick up friends by sea, and the adjacent beach. Ribbons was built originally as an icehouse in 1885 and has a long captivating history, Tennessee Williams being just a part. And, if this isn’t enough you can bring your well-behaved pooch and walk the tidal flats at low tide. It really doesn’t get better! Parking for one car in tandem with other units. Spacious double-size cabin at the very end of the wharf. Two units have been combined to form this spectacular, romantic retreat (you can hear the waves lapping beneath you), consisting of a two-story “great room” with windows on 3 sides and huge glass sliding doors opening onto the deck and the breathtaking views of the harbor ahead; a sleeping loft with a queen-size bed; a secluded bedroom with a king-size bed; a fully equipped kitchen with new appliances; dining table for six; bath with shower; bonus private outdoor shower; laptop safe; and wireless Internet. You can moor your skiff right off of the house! Completely designer-renovated in 2011 — the ultimate seafaring hideaway. Secluded, airy cabin with lots of windows facing east towards Provincetown Harbor. Two rooms conjoined into one large space. Queen sized bed, comfortable couch, daybed, and lots of books. Private deck overlooking wharf rooftops and bay. Large full kitchen and dining area, private bath. Sorry, no cats. Go to sea on dry land in this romantic, two-room cabin. Cozy captain’s bed and sleeper couch. Antique claw foot tub inside, shower outside. Mid-wharf with deck space east and west, stunning views. Sorry, No Cats.